This 8mm x 8mm sky blue topaz heart-cut ring from Apples of Gold Jewelry is a perfect piece of jewelry for the one you love! A sweet Sky blue topaz gemstone, cut into a heart shape, sits in the middle of a ring in your choice of 10K, 14, or 18K white gold, with a lovely cut out pattern design on the setting. The authentic sky blue topaz stone measures 8mm by 8mm in size and is AA rated, and will capture just the right amount of light and add to the shine of the gemstone and the white gold of the ring. 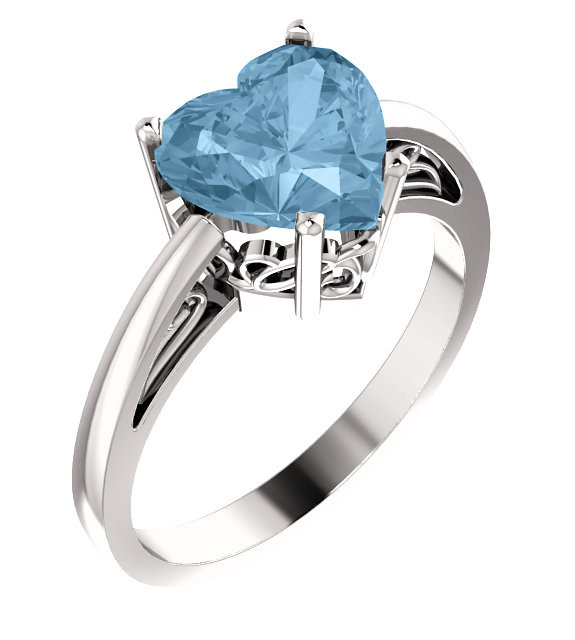 We guarantee our 8mm x 8mm Sky Blue Topaz Heart-Cut Ring to be high quality, authentic jewelry, as described above.